Publisher's blurb: "Set in the Sindal Subsector featured in the recently released Traveller Core Rulebook, Marooned on Marduk is the perfect introduction to the Trojan Reach and the new edition of Traveller. 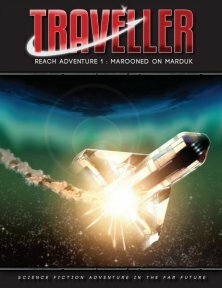 "The Traveller's shuttle to Marduk is damaged during an attack by raiders, forcing it to crash-land far from civilisation. With night falling and little prospect of immediate rescue the Travellers will be forced to seek shelter in nearby ruins, where they discover they are not alone. "If the Travellers can just survive one night on Marduk, rescue will surely come. At worst they face a three-way fight for survival... or perhaps they can befriend the xenophobic survivors and team up against the raiders. "What might the outcome of such an alliance be?"